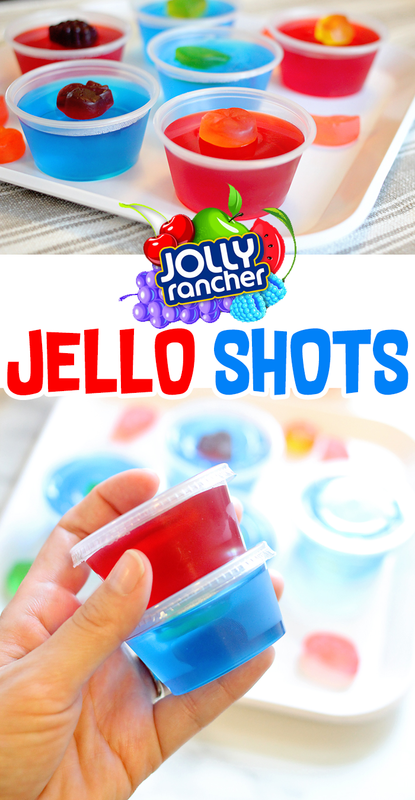 Check out these Jolly Rancher jello shots. 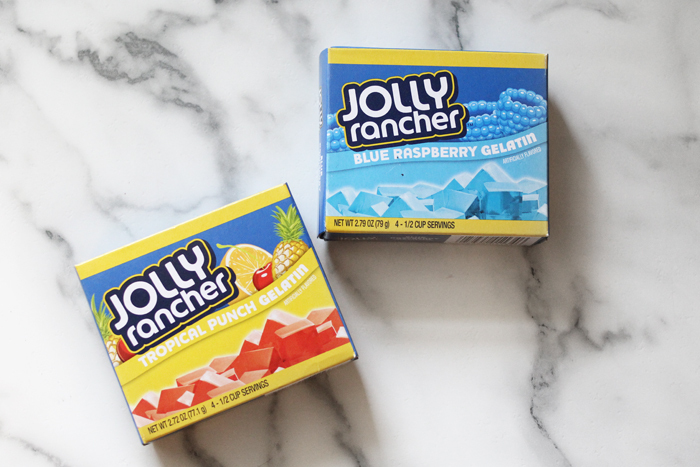 We’re making two delicious flavors so you can take your pick or make them both! 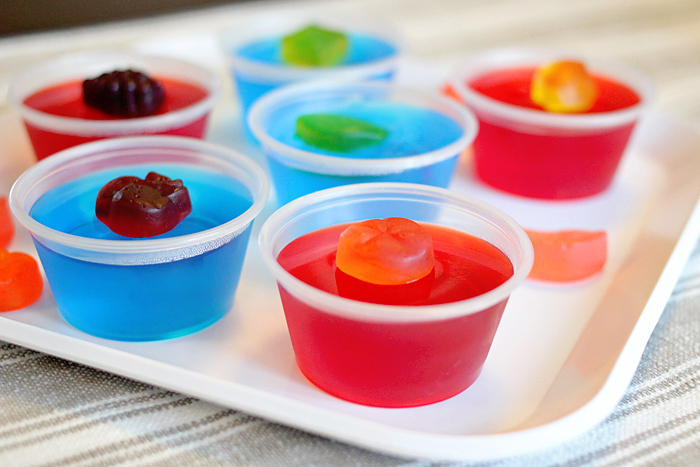 Jello shots are such a fun treat to make for the grown-ups when you have BBQ’s and parties. We even made some last year to celebrate Shark Week! Go check out the Bloody Shark Shots and Fish Bowl Shots. When you make Jello Shots, you follow the recipe almost the same as it says on the box but with one adjustment. The part where you pour 1 cup of boiling water over the gelatin mix is exactly the same. But, when you add the cold water, you only use half a cup. The other half a cup will be your liquor. They’re super duper easy to make. The hardest part is pouring the mixture into the tiny cups! When your jello sets, top them off with a Jolly Rancher Gummy candy. These have the exact same flavor as your class Jolly Ranchers but they’re chewy. Even with the candy on top you’ll be able to put the lid on your plastic cups so you can take them to go. Of course, you could leave that part out if you want. It just adds a little fun pop of extra color on top. 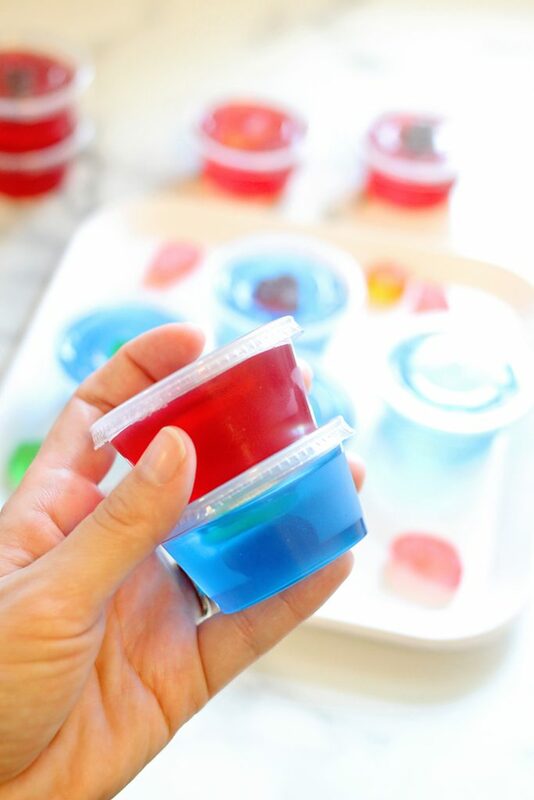 You and your guests will love these jello shots and they will quickly become a favorite at your parties. Feel free to change up the liquor flavors and try new things! 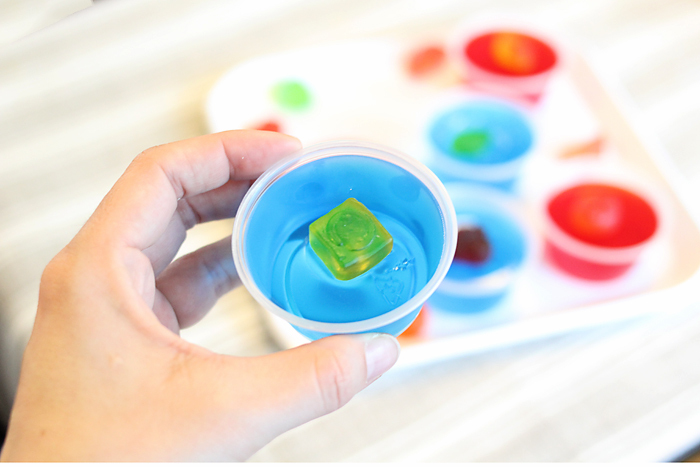 You can find lots of yummy jello shot recipes at Kitchen Fun, too! Slowly add boiling water to gelatin mix in a medium mixing bowl. Whisk until jello is dissolved. Add the cold water and liquor; stir. Refrigerate until set and add a gummy on top.